Description: Silver etched "Embroidery" and delicate beading complement this princess line "Matte Italian Satin" dress with double spaghetti strap back. Bias trim accents the neckline and cut away brush train. 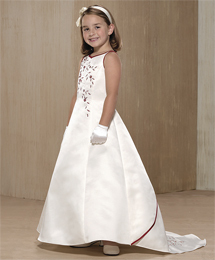 Colors: Ivory/Cranberry, Ivory/Ivory, White/Cranberry, White/White Accessories: Includes self crinoline.